* Business travel luggage (carry-on and checked). I have an otter green Filson laptop bag that, while a bit iGent trendy, really is perfect. Based on that, I’m looking at getting a matching Filson suit bag and medium duffle for short business trips. I’ve also got a Maxpedition tactical go-bag for no notice deployments that I leave in my car. 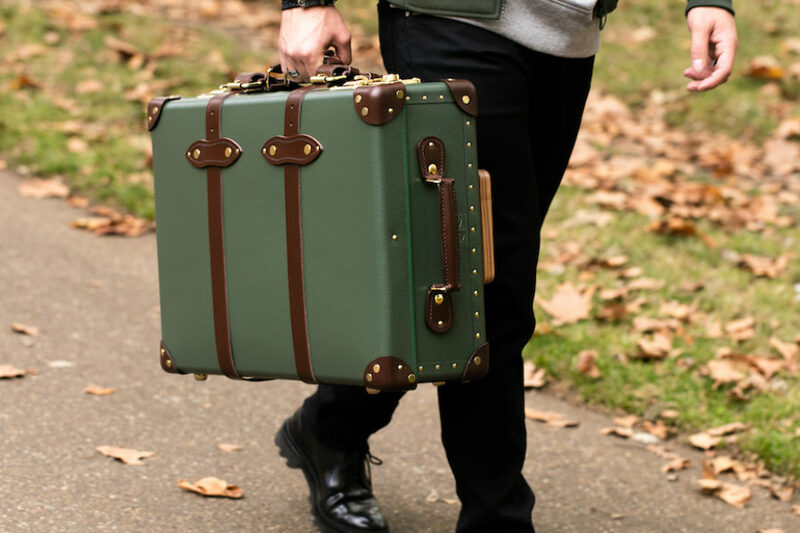 I've got a few different briefcases/bags, including a "top-frame" bag by Swaine Adeney Brigg for Brooks Brothers, lined in green suede pigskin. It's gorgeous, but a bit heavy. The bag I use almost every day, though, is a Filson 256. It's pretty informal, of course, but it's just so convenient. Ah, I just looked up the model and that’s the bag I have, too. I got mine about four years ago - I’ve read that the bridle leather was even better on earlier productions (those with YKK and Talon zippers) but this sure seams nice to me. So now I’m looking to buy the medium duffle or a 246 to match. The suit/garment carrier looks great too, but I’m not sure how much use I’d get out of that. Laptop bags: trusty Wegner. Reasonably priced and good durability. I see many use Tumi and I do not get the hype. Mandatory, expensive, housewife-style shopping bag for posing in iGent fashion pictures. That's sooo 2000s. I've got a zero-carbon green woke tote bag with some advert for organic vegetables. Which I got for free. Pitti here we come. I prefer the Sweaty Balzac model, made from real Gerard Depardieu scrotum. Barneys warehouse has some Billykirks bags. I own two, Filson quality without the Filson price. Wouldn't you need to clone Gerard Depardieu first, in order to obtain the requisite number of scrotums (scrota?) to make one bag? No I think one would be big enough. i know some people in the travel set swear by them. Others thing B&R is just as good. Others like Red Oxx and the 1-bag policy. Tastes in luggage is like tastes in women. I saw an aluminum Rimowa on the plane yesterday, it appeared clunky so I googled the price. It is definitely the Lobbs of luggages. I wasn't sure of the quality. Apparently it can dent pretty easily, but some people like the somewhat battered look, as it makes them look like seasoned globetrotters. Speaking of globetrotters, that's also the name of an old English luggage brand - Globetrotter. It's more the Lobb of luggage, as a suitcase will set you back about 3000 pounds. I just bought a ‘vintage’ (Talon zipper) Filson Medium Travel Bag for short business road trips. Filson Medium travel bag with the leather soaking up some Obernauf’s. Did it have a matching FTL tag? Price might be the Lobb of luggages, regarding image and quality of manufacturing it is more the Gucci/Versace of luggages. Lads, I'm in the market for an overnight bag. Nothing too massive. Something that can fit a pair of shoes, skids and socks, a shirt, a sweater, and my wash&shave kit. My suit travels in its own bag. I've trawled the internet but all I see is made-in-China tat in faux leather that I know for a fact will disintegrate within weeks. Canvas is fine (for one thing, it's light than leather, faux or otherwise), and I haven't the means to hire native porters. +1 on Filson - really well made and will quite possibly last a lifetime. The vintage Filson MTB I just bought (above) is perfect for weekend travel. The newer medium duffle fills the same role, but lacks the divider pockets on the sides. Then there is the pullman model the 246 and a range of ballistic nylon models. Obviously the toiletries bag is only out for the photo, but I’m packed for a conference. I just need a nice bag to carry an extra sports coat now. Packing compression cubes and shirt envelopes are a total game changer! I have an old cardboard suitcase with various family papers inside. It is not used for travel. I await articles reappraising and celebrating such poor people’s luggage. My grandfather told me that when he first started going away on courses for the oil company Shell, that would have been the mid-50s or even early 60s, some of the attendees that were foreman types would turn up with paper bags or indeed cardboard suitcases. I have two of them, which I use for storing various bits and bobs at home. They look like 1950s or 60s pieces. Or perhaps they're older. They have a decades-old patina that would blow the iGents off their feet. Yes. Not as nice looking as these Czech examples. No brightwork or reinforcements. Army surplus gear might be reasonably priced. Yes. I had a school "port" (a sort of satchel, used to carry schoolbooks) made out of compressed and coated cardboard, with leather shoulder straps, when I first started going to school. I'm skint, so I went for a Highlander canvas holdall. I have an all satin black Rimowa I use if I have to carry suits or jackets. It's a very rugged piece. Have seen them and they look sound and good value too. At school in Brisbane did they call you ‘briefcase mong’? I have a kit bag from these guys up in Byron Bay - good quality and good price. Not sure what shipping is like o/seas but free in Oz.